Today’s Featured Friend shows cute ways to surprise Mom, but (I admit that I’m so bad because) instead of opting for a surprise, I actually found the gift I want our kids to give me this year. Then, I did more than just drop a hint to my husband. I picked it out, handed it to him and asked him to buy it! We were at Barnes and Noble and there was a little book, small enough to fit into my diaper bag (AKA, my momma purse). Inside this little memento are pages of questions for kids to answer about their mom, like, “I love that you encourage me to ____”, “You are so ____”, “I love it when you call me____” and so on. When I discovered this book, I was elated because I cannot think of a better team than these two artists, Bunting and Brett. We have so many of their individual works, so having a book by two of our favorites is a Mother’s Day gift in itself. Three Mice, Biggest Little Mouse, Middle Mouse, and Little Mouse, wake up on Mother’s Day while it’s still dark to go out and get their special gifts for Mother Mouse. The two oldest knew exactly what they wanted to find: The Biggest Little Mouse, a strawberry, as it reminded Mother of the coming of summer; Middle Mouse, a wish flower (dandelion fluff ball), as Mother could make a special wish. Little Mouse however, wanted something that was even more dangerous to attain, honeysuckle. The danger is spelled b-i-g, b-l-a-c-k c-a-t which always lay on the porch of Honeysuckle Cottage. While waiting for this monstrous threat to leave so they could secure the honeysuckle and scamper home, the mice heard someone playing the piano from inside the cottage. The tune of “Twinkle, Twinkle, Little Star” filled the air, only encouraging the cat to slumber on in the sun. When they could not wait any longer, the three mice started for home. The two older mice suggested various gifts they came across on their journey back: daisies, rocks . . . but Little Mouse had an idea that excited him more than the honeysuckle he originally wanted for Mother. “ ‘Happy Mother’s Day,’ they all shouted when she came in the kitchen, and Mother said: ‘Why! You Remembered!’ ” Mother Mouse blew the fluff ball and made a wish. She ate the strawberry and thought of the coming of summer. All the while, Little Mouse waited. “ ‘Now ME!’ he said. He was so excited he thought he might explode, like the fluff ball, into a million pieces. The music he’d heard at Honeysuckle Cottage was loud in his mind and he clasped his paws and began to sing. He sang the words he’d thought of as they ran home. F- What gift would make your mother feel loved on this Mother’s Day? R- Can you relate to Little Mouse thinking up a sentimental gift instead of a tangible gift? I- Imagine that you could do anything you wanted for your mom this Mother’s Day . What would you do? E- Explore other things that the three mice may have discovered for Mother’s Day gifts in the meadow. N– Navigate their journey by drawing or listing the dangers the mice came across while searching for the gifts. D- Develop a keepsake for your mom by drawing a picture, or writing a poem, song, or card for her to keep. S- Share a Mother’s Day card with someone that’s “like a mom” to you, so you can encourage a couple of special ladies this Sunday! 5 More Days to Find Many Fun Ways to Surprise Mom! 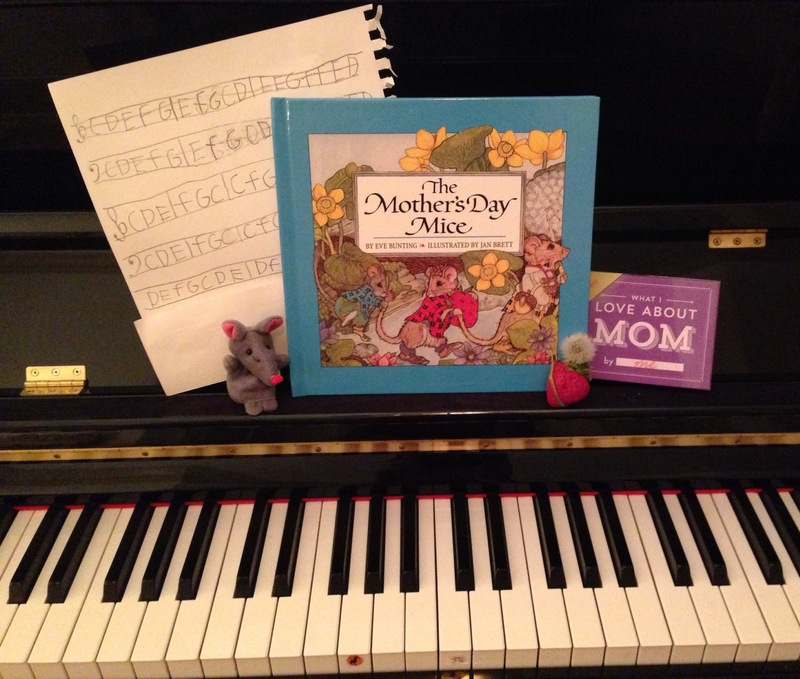 This entry was posted in Mother's Day, mouse and tagged dandelion, dandelion fluff ball, Eve Bunting, Jan Brett, mice, Mother's Day, Mother's Day books, mother's day gifts, mother's love, piano song, strawberry, The Mother's Day Mice, twinkle twinkle little star. Bookmark the permalink.